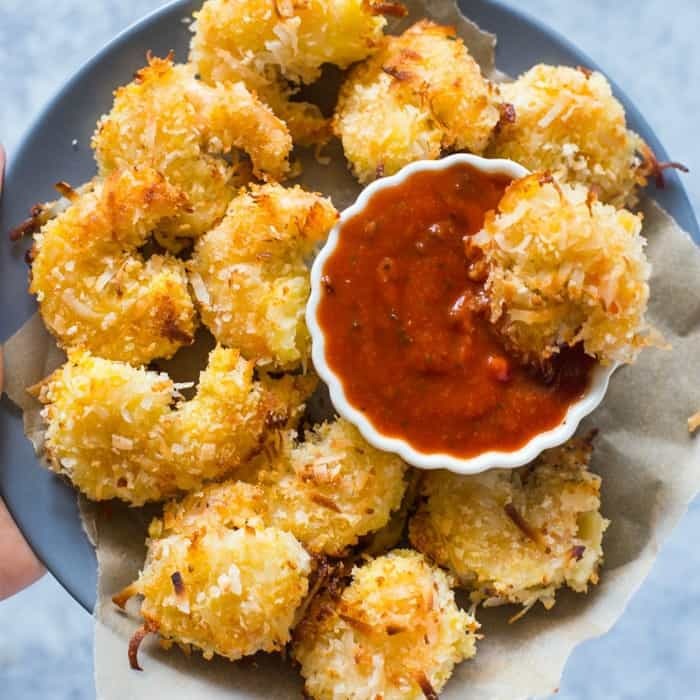 Crispy baked coconut shrimp is super easy to make and is a perfect healthy appetizer. Hey guys, It’s Layla here from GimmeDelicious.com and today I have a super easy and healthy recipe for you today. 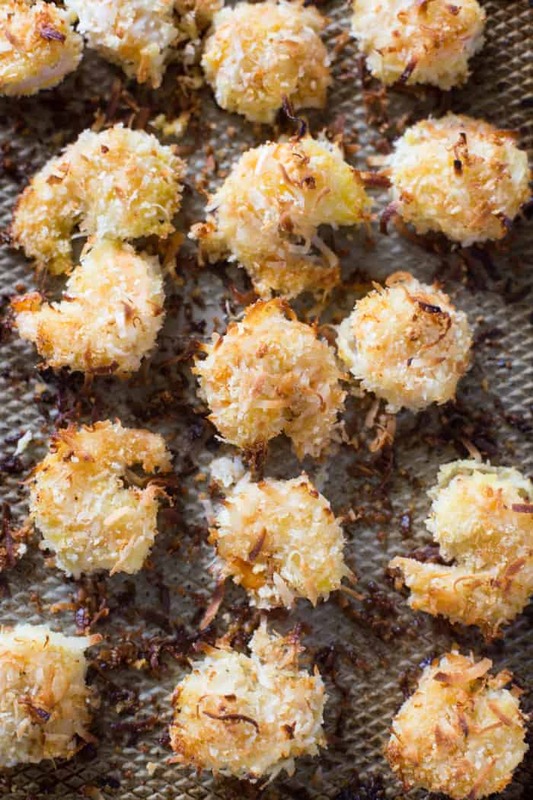 Its crispy coconut shrimp they’re its baked! I love making baked versions of my favorite fried foods because you get all the flavor without all the added calories. This baked coconut shrimp is super super easy to make and even easier to eat! The shrimp is crispy and crunchy on the outside and tender on the inside. I like to use a mixture of panko breadcrumbs and coconut to coat the shrimp so you get different textures and flavors on there. To get started simply combine the panko and shredded coconut in a bowl and set aside. In another bowl season some flour with salt, pepper, garlic powder, and paprika and set aside. and lastly, crack eggs in a small bowl. 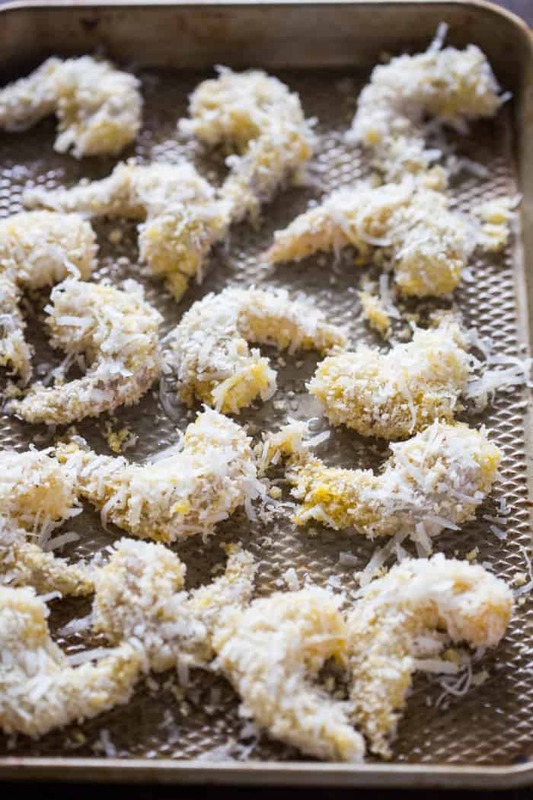 Then you simply dip the shrimp in the flour, egg, and coconut mixture. Lay evenly on a greased baking sheet and drizzle or spray with a light layer of oil. Bake for 12 minutes and that’s pretty much it! The shrimp is simply irresistible and makes the perfect appetizer or side dish!! Pre-heat oven to 425F. Grease a cookie sheet with oil and set aside. Beat eggs in a small bowl and set aside. 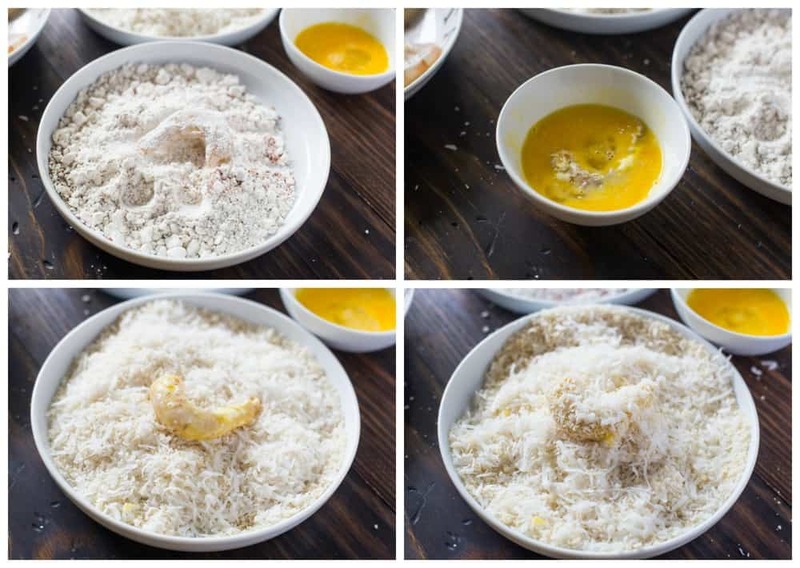 Combine breadcrumbs and coconut in another bowl and set aside. Lastly, combine flour and spices in a 3rd bowl. Dip shrimp in small batches in the flour mixture then the egg mixture (letting the excess drip off the shrimp) and then coat in the coconut/breadcrumb mixture, pressing to adhere. Place the shrimp on the baking sheet in a single layer. Lightly spray with nonstick spray or drizzle with oil. Bake until the shrimp are golden on the outside and opaque in the center, about 10 minutes. Hey girl I bet these would be really tasty! What is the sauce served with the coconut shrimp? It is a cocktail sauce. Just made these and wanted to thank you!! So delicious and easy, especially with TJs chili sauce! Why do we leave the tail on the shrimp? It just makes it easier to pick up. You can always take it off if you would like! Cricket – And she still hasn’t done it! I proof read all my daughter’s blogs and she changes them immediately. Focus on the good and positive, not the bad. Can’t even begin to tell you how many times in life I’ve messed up, lol; at any rate, can’t wait to try this. Looks pretty yummy!! ? If only we could all be perfect ? I love the sweet creamy sauce Red Lobster serves with their Coconut Shrimp! Any idea of the recipe for it or something similar? Thanks! Has anyone tried prepping and freezing these? I’d love to make a big batch and just be able to pop some in the oven from a frozen state–like the kind you can buy in the freezer section. I’d be interested in making ahead and freezing for a party. I’d love to be able to just throw them onto a baking sheet in the oven just before serving. Did you try it yet? Prepare & bake first then freeze? Or prepare and freeze before baking? If using frozen shrimp should they be thawed before hand? Delicious!!! Sweet with a hint of garlic. I skipped the oil spray and popped them into an Air fryer at 390° for 5 minutes… perfection! Would love if you added a suggested measurement for the salt and pepper. I definitely didn’t have enough in mine but had no idea about “to taste”. Am I supposed to taste the flour mixture or something? I just made these without we LOVED them! I ended up cooking them 14 minutes. Thank you for the recipe. I served them with TJ’s Sweet Chili Sauce. My 16 year old son at 15 of them! It was so delicious, I forwarded the recipe to my mother in law! Thank you! I have made these at least 5 times now and they always come out perfectly! My husband and I buy a bag of frozen, shelled, deveined shrimp at Costco monthly and this is a good, easy recipe and perfect for the shrimp! Thank you ! I love that these are baked! So much less pressure than deep frying and a LOT healthier. Thank you so much for the recipe! Is the Shiimp Already cooked or is it raw when you start out? Either way is actually great! Does this recipe start with raw or pre-cooked shrimp? Is this recipe made with raw or pre-cooked shrimp?